Please refer to our stock # 01889 when inquiring. 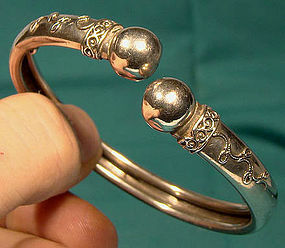 A late Victorian (unmarked but tested) sterling silver wrap or spring-style bracelet c1880s-90s. This bracelet measures 2-1/4 x 1-7/8" across the interior at rest; it is 3/8" wide at the two ball terminals. It has fine wirework decoration, it weighs 14.7 grams, and it is in very good condition with no dents, bends, corrosion, damage or repairs other than an original split at the center of one ball (done at the time of manufacture) and the loss of a tiny bit of the wirework. All items are thoroughly and conservatively graded and all condition issues are noted; all items are vintage or antique and may have slight signs of gentle use. Surface insured shipping to the U.S. is $6.30 (other spots may vary) - insured is higher, and mandatory on items over $95 if paid with a credit card. Items paid with a credit card will be shipped to confirmed addresses only. We do ship internationally. All of our prices are in $US. NOTE: we DO NOT accept PayPal, only VISA and MASTERCARD.